PMC discovers and markets unique products. In parallel with providing plant maintenance services worldwide, PMC conducts transactions with various manufacturers around the world. Utilizing this advantage and experience that the company has accumulated over many years, PMC identifies products that have unique characteristics and markets these products under agency agreements with such manufacturers.These products are deeply related to plants and valuable in the global market. of AGC Technology Solutions Co., Ltd.
GL(R) is a glass-lined pipe. The inner surfaces of these metal pipes are lined with glass – a world first. 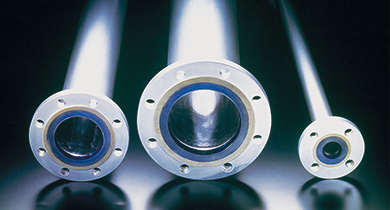 GL(R), with superior resistance to corrosion, heat, vacuums, adherence, and other features, is suitable for use as industrial piping in a range of areas including chemicals, electronics, medicine, and agrichemicals. of Nippon Carbon Melsen Co., Ltd. This “impermeable graphite”, composed of artificial graphite impregnated with synthetic resin, provides superior corrosion resistance. 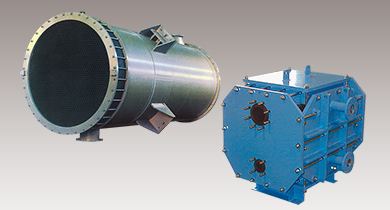 The products are widely used as material for tubular heat exchangers, towers and inner parts, rupture disks, etc. PMC sells these impermeable-graphite products. 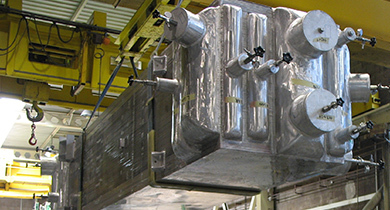 Fives Cryo, France, is a member of Fives, one of world’s largest engineering groups. The heat exchangers produced by Fives Cryo are suitable for separating, purifying, and cooling of low-temperature gases. We use these products in gas/LNG plants as specialty equipment. 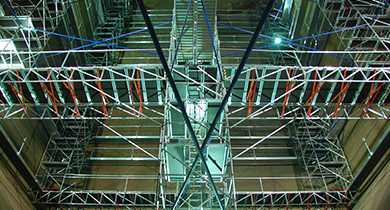 Boiler Access Quick Assembly System is a type of temporary scaffolding, created by Instant UpRight Ltd., Ireland. Temporary scaffolding is essential when carrying out maintenance of large boilers. The system can shorten the assembly period from 7-10 days to 3 days, greatly reducing the shutdown period, labor costs, and transportation expenses.